With the industry growing exponentially, professional owners have to be on their toes to manage the changes that will come at them from all angles. Whether it's dealing with OTAs moving the goal posts yet again, or the potential of short term rental legislation, or the massive competition we’ll experience, there is a challenge on every corner. But fear not. You can be proactive, and put your house very much in order to meet these challenges. In this first episode of the new year, Mike and I share our thoughts on what we all need to do to be successful in 2017. We cover five actionable points and include a lot of tips to help prepare for success this year. A hurricane is forecast, there’s an oil spill in the Gulf, a wildfire threatens to engulf a resort town, or more simply the AC packs up in the middle of a heatwave. 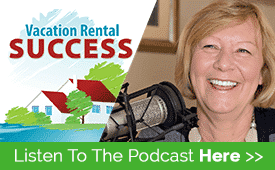 There can by myriad situations that can threaten your rental livelihood, and if you prepare for each and every one of them, you will be more likely to weather the storm than your neighbors. It’s just a matter of planning. From major to minor incidents, we talk about how important it is to carry out a disaster planning exercise so that handling an emergency is simply about putting a procedure into motion. Every guest that comes to you from a third party site gives you an opportunity to market. Even if they don’t come back to you, they may have friends who will. So even if you didn’t get the traffic from your own site to begin with, you can surely bring them back there next time. 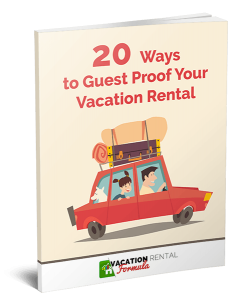 Mikes shares the five points to cover in a strategy to keep your guests and have them come back to you again and again. Getting together with other owners, networking and collaborating, is going to be a theme for 2017. We cannot operate in a vacuum anymore and need to create alliances in order to challenge potential legislation with a common voice. You can also share common pain points and work collectively to resolve them. I talk about several ways in which you can collaborate and present a united front in 2017. The Airbnb platform has shown millions that they can list their property and make some money so you now have a broader competition. Most will simply use Airbnb and rely on that for traffic. To stand out from the crowd you need to be unique, target a niche, become a local expert, and set yourself apart. Mike and I are both working on our respective vacation rental updates as I write this. For me, it’s new furniture and bedding as well as upgrading some technology. For Mike at Sea Breeze, he’s working on updating his facilities for children – a niche group for him. We hope you consider all of these points and take some positive action this year. Heather; Just wanted to thank you for the podcasts. Just finishing up our first year in the VR business and thanks to you we’ve been pretty successful. I looks forward to every Wednesday. I also just have you a plug on HOUZZ.com. 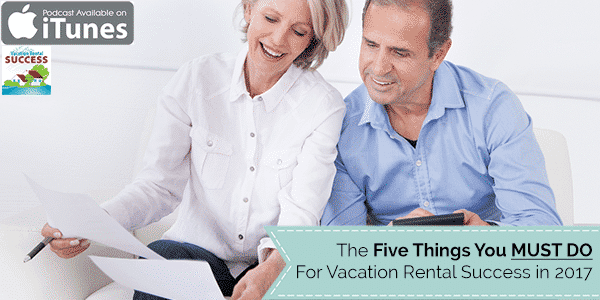 They had an article on Tips for setting up Vacation Rentals. I suggested they listen to your podcasts. Thanks again for teaching me so very much this years. Hope this year brings you much success. Hope to get to the VR success summit this year. Hi Rosana – I really appreciate your feedback and am so glad you have been successful. And thank you for the plug on Houzz.com – that would explain the high download stats this week! Would love to see you at the Summit – contact me directly for a discount code.